The 24.38 metre motor yacht The Pearl, listed for sale by Chris June of Worth Avenue Yachts and Steve Sprigg of Sprigg Yacht Consulting, has been sold with Michael Kusler of Kusler Yachts introducing the buyer. Launched in 2008 as part of the Ocean Alexander 80CMY series, she was built from a GRP hull and superstructure. Her exterior styling and naval architecture are by Ed Monk Jr, while her interior décor comes courtesy of Fujita. Accommodation is for six guests split across three lower deck staterooms, including an amidships master suite, a twin cabin and a double VIP suite in the bow. Meanwhile her crew quarters allows for a staff of two people. Her full-beam aft deck features built-in bench seating and three folding deckchairs, which provide an al fresco dining option for light meals around a curved wooden table. Moving inside through sliding glass doors and her elegant saloon boasts a large L-shaped sofa and two armchairs. Further forward and the wheelhouse is open-plan with an adjacent seating area and a country-kitchen style galley. Guests can relax on the convertible flybridge, with its C-shaped wrap of seating and twin sunpads. Additionally, the high bulwarks and rod holders in the cockpit make her a great option for deep-sea fishing. Power comes from a pair of 1,500hp MTU 10V2000 diesel engines that allow for comfortable cruising at 18 knots, topping out at 24 knots. Highly specified, she has been fitted with Cruisair air conditioning and Keypower stabilisers. 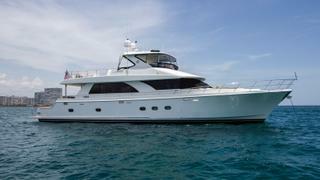 Lying in Fort Lauderdale, The Pearl was asking $2,349,000.